Footwear today combines the latest fashion trends with functionality for daily use. Shoe trends are often dictated by the stylists and tastemakers of the day and by the economic climate. It might be surprising to learn that times haven’t changed much since the medieval period. Perhaps the one thing that has changed about fashionable footwear (other than the fact that today’s shoes are much less pointy) is that shoe styles are no longer dictated by rulers. Just as it is today, the history of medieval shoes is interesting and many times surprising. In the early thirteenth century, medieval shoes were pretty much all the same. Made of leather, shoes were basically an item of function. Women’s medieval shoes were rarely seen because they were often covered by a long dress. For nobility, however, shoes were directly under the influence of the Byzantines. These medieval shoes featured Latin inscriptions, elaborate embroidery, and almost always had pointy toes. After the Plague ravaged much of Europe, there was a change in the fashion of medieval shoes, probably due to the fact that many shoemakers had perished from the Plague. As wealth was redistributed, many of these newly wealthy people wanted to show off their money, so they increased the points on their pointy shoes to an almost comical length. Both men and women indulged in this fashion, but men’s medieval shoes usually had much longer points. King Henry IV of England hated this style. He hated it so much, in fact, that he tried to regulate the pointiness of medieval shoes. He set Sumptuary Laws, intended to regulate such extravagance as pointy shoes. As with most things during that period, the wealthy and nobles were allowed to have points two feet long, the merchants were allowed to have one foot long points, and peasants were allowed a half foot’s length. Even though these laws were passed, they were rarely enforced, making it quite a “pointless” law. 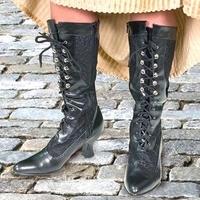 At PearsonsRenaissanceShoppe.com, we have a large selection of period accurate medieval shoes, as well as Renaissance era shoes and steampunk shoes. Take a look at our full selection today!